On Monday, it was Amazon Web Services(s amzn). 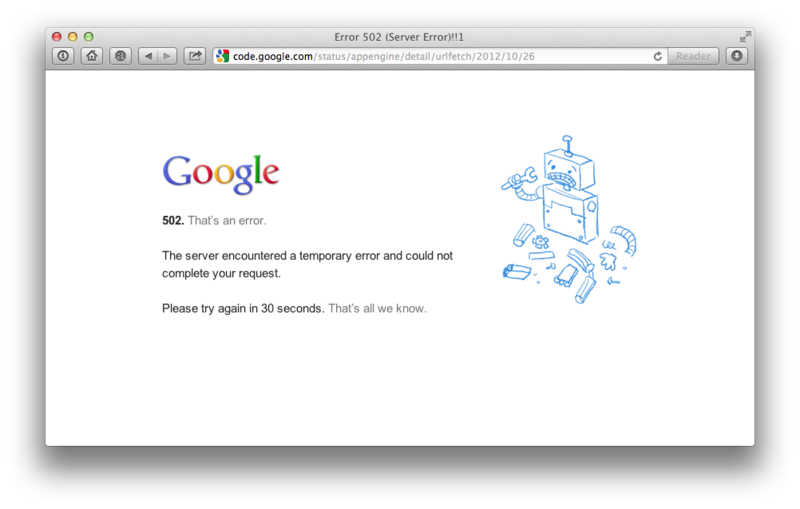 On Friday, Google App Engine(s goog) crashed and burned. Update: Google’s latest update posted at 10:52 pm PDT said the company was working to correct ongoing issues but still sees slow response times and elevated error rates. The outage was noted all over Twitter and a visit to the GAE status page around noon eastern time turned up an error message. To be fair there appears to be more going on beyond GAE: Both Dropbox and Tumblr have had widespread availability issues today. Both #Tumblr and Google App Engine, #GAE, are down. What gives? We’ll update this post as we learn more about the nature of the outage, and let us know if you or your business is having problems. Looks like GAE is back up and running! Seems like a key difference between the AWS and App Engine outages is that with AWS you can architect your application to handle failures because you have machine level access and the ability to deploy across availability zones and regions. Since App Engine is more of a platform you simply outsource this part and let Google deal with redundancy, much like Heroku. It appears some of the App engine status pages… run on the App engine. Brilliant! yes the screen grab i used as feature art is the error message i got wehn i tried to access GAE status page. But it was back up a few minutes later.